Good afternoon from Orange County everyone! I’m one Newport Beach Wedding & Portrait Photographer who’s excited to to share with you one of the most magnetic, romantic & crazy in love couples with you for the first Engagement Shoot of 2012 photographed down near San Diego in La Jolla. As I had mentioned yesterday in Linda’s Long Beach Portrait Shoot and on Twitter & Facebook, 2011 was bursting at the seams with Engagement Shoots, Portraits and Weddings I photographed from Newport Beach down to San Diego and all the way up to Oakland. There was even the Military Promotion that went on throughout the end of 2011 and the Workshop I taught with my good friend & fellow photographer Danny in Paris France. 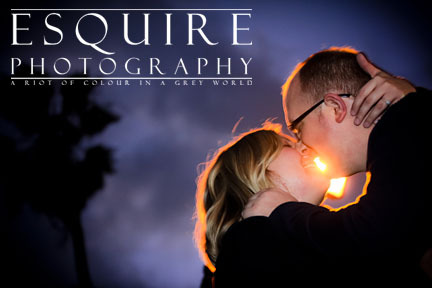 So to kick off 2012 properly with a totally romantic La Jolla Engagement Shoot with Laura & Josh is perfect! But over the years, I’ve learned to not worry about it & roll with it. Which was perfect because I wasn’t stressed about it & was totally love Love LOVING the gorgeous tropical & stormy sky we had for their Engagement Shoot. Laura, Josh & I had a total blast throughout their entire Engagement Shoot on the sand in La Jolla. There was a gentle breeze, the tide coming in and pleanty of seals and seagulls. In fact, those pesky seagulls were just waiting for us to come a weeeeeeee bit closer too. It was all fun & games as we joked saying how it’s good luck to get pooped on… But when one of them aimed for Josh – we all busted up laughing! You’ll see the moment it happened with the expression on Laura’s face in one of the photos in the slide show too. LOL! By the time it was a wrap in La Jolla, we captured an awesome and diverse collection of photos during the Engagement Shoot. I even had an opportunity to capture some of my Signature Night Romantic Portraits of them too! I love Love LOVE it!!! But before you scroll down to check out Laura & Josh’s Engagement Shoot I photographed with them on the beach in La Jolla down by San Diego and you’re thinking… Hey – I’d really like to get to know this Newport Beach Wedding Photographer (Previously a Huntington Beach Wedding Photographer) that loves music & fashion, photography and art – feel free to contact me anytime. Perhaps you’re a fan of Nachos & Newcastles (like Duran Rex and I) and if so – we could always meet at Fred’s Mexican Cafe on Main & PCH in Huntington Beach. They’re awesome there! to show some love for Laura & Josh’s La Jolla Engagement Photo Shoot!